Prepare your graham cracker crust layer (recipe below), setting aside about 1/3 cup or so for garnishing. Prepare and pour on the Pumpkin Pie Layer (recipe below). Allow this layer too cool slightly, about 1/2 - 1 hour. The top should be sticky to the touch and still slightly wiggly. Prepare and pour on the Rum Cheesecake Layer (recipe below). Allow to chill until fully set, usually about 4 - 6 hours, overnight is best. Cut your cocktail gels with a sharp knife warmed with water or fun cookie cutters. Place the cocktail gel on your plate. Dust the plate with some pumpkin pie spice. Place the mini pumpkin pie gels around the spice. Top the Pumpkin Pie Cocktail Gel with a sprinkle of the saved graham cracker crumbs, a dollop of whipped cream and one final mini gel. Press mixture into the bottom of a 9x12 cake pan. Bake at 375 degrees F for 7 minutes. Add 2 cups of the water to a sauce pan, add the gelatin and allow to dissolve for 2 minutes. Add the pumpkin puree, spices and sugar then heat on medium until all the sugar has dissolved and the mixture is smooth. Remove from the heat, allow to cool until you can touch the pan with your hand. Combine the vodka, rum, half & half and the remaining water. Add this to your gelatin mixture in the pan, blending well. Pour onto your graham cracker crust. Dissolve the gelatin in the water and set aside while you mix the pudding and milk. With a hand mixer, blend the pudding and milk just until completely smooth, about 1 minute. Add the dissolved gelatin and blend well. Pour in both the rums and blend on low. Pour on top of the Pumpkin Pie Layer. Fall has arrived and you know what that means, pumpkin is the word of the season. 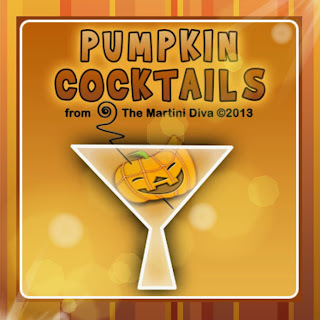 Autumn just brings out those pumpkin and spice cravings and I just happen to have a nice little collection of Pumpkin Cocktails for you to satisfy those cravings with. So grab that squash you were going to carve into a Jack O'Lantern (or a can of pumpkin puree if you happen by here outside of the pumpkin holidays) and shake up a pumpkin cocktail or make some homemade pumpkin booze instead! National Pumpkin Day is October 26th. 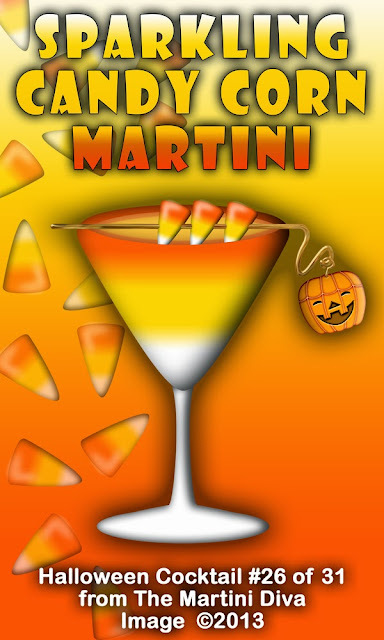 I have another Candy Corn martini which is made with Blavod Vodka and, thus, it is a black martini called the Candy Corn Creeptini. 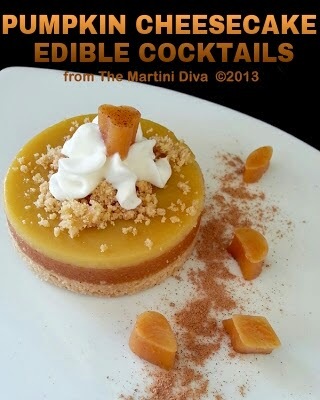 This one is so you can have an orange colored martini to match! 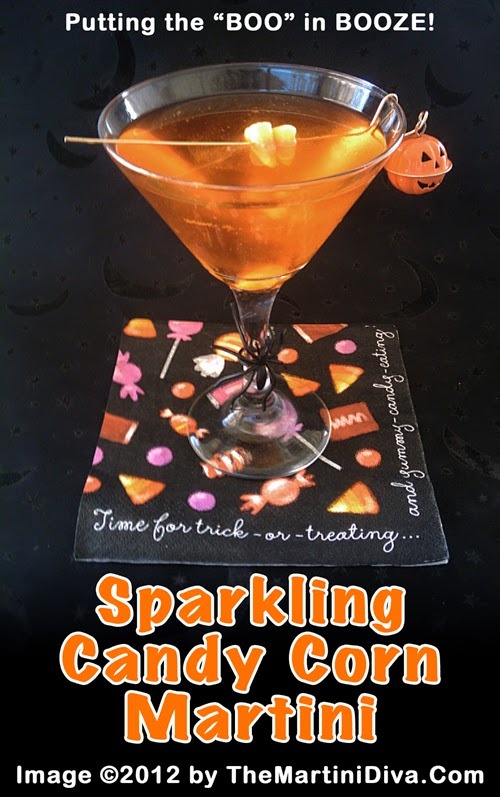 Make your candy corn vodka at least 2 days ahead, if possible. Add the lemon juice and Candy Corn Vodka to a cocktail shaker filled with ice and shake until chilled. Fill your glass half full then top off with the dry Champagne. Skewer a few candy corns on a cocktail pick, add to your cocktail and serve. It's very important to use a DRY sparkling wine or Champagne here because it balances the sweetness of the candy infused vodka. The lemon juice also aids in balancing out the sweetness and adds a nice bit of acidity as well.